The concept of a reusable single-stage-to-orbit Vertical Take-Off Vertical Landing (VTOVL) launch vehicle that would reenter and return to its launch site for turnaround and relaunch was first proposed by Philip Bono in the 1960's. The appealing simplicity of the concept has been offset by the technological risk in developing it. The problem with any single-stage-to-orbit concept is that if the empty weight of the final vehicle has been underestimated it will not be able to deliver any payload to orbit, or even reach orbit. Since weight growth of up to 20% is not unknown in aerospace projects, this is a very real threat which has made both NASA and private investors reluctant to invest the billions of dollars it would take to develop a full-scale flight vehicle. Bono's vehicles proposed minimizing weight by using plug nozzle engines. Cooled by residual hydrogen fuel, these would act as a heat shield for re-entry. More conservatively the recent DC-X designs used a conventional forward heat shield for reentry. 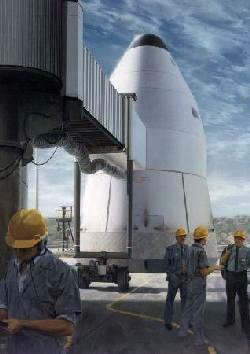 The concept was not selected by NASA for the X-33 (an even more risky lifting body design was chosen). This was perhaps the last chance for the concept. The more conservative Kistler recoverable reusable ballistic launch vehicle uses two stages, thereby minimizing the risk.